Following the furore surrounding ex-CIA and NSA whistleblower Edward Snowden, we now also know that security agencies in the US and UK have been routinely collecting personal communications from private citizens via the clandestine data-mining program PRISM. Using a combination of encryption, ciphers and peer to peer messaging, Redact is capable of sending messages between phones without passing through any central servers. Messages you have sent or received can then be redacted from both handsets at the touch of a button – to be forever lost in the abyss with no method of recovery. What’s more, there are no ways of refusing or avoiding a redaction – so it’ll be as though the message never existed. 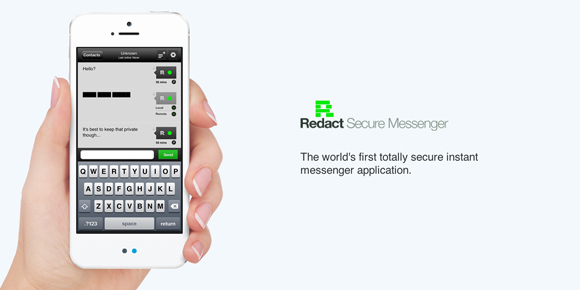 Redact is uniquely positioned within the messaging market, and while unlikely to take on the likes of What’s App for general purpose messaging – it’s secure service is a notable selling point. Unlike rival apps, Redact does not request a username, does not link to social media accounts, has no interest in an email address and cares not for accessing contacts. Instead, the app gives the user a unique PIN and lets the user set up an alias which only they can alter, ensuring no name appears anywhere in the app. Security like this comes at a cost, and the app is priced at £3.99 in Google Play. But if you’re looking for a complete peace of mind over your sent and received messages, then Redact’s one-off cost will seem a small price to pay.